It was always Sven Kramer’s to lose, but the consumate professional athlete that he is did not disappoint and he convincingly took the gold medal in the men’s 5000m in a new Olympic record time of 6:09.76. In the previous pair, world record holder Ted-Jan Bloemen of Canada went toe-to-toe with Norway’s Sverre Lunde Pedersen in a thriller that saw the Canadian edge out the Norwegian by a mere 2 thousandths of a second (for an article about timing equipment and how such close results ought to be considered equivalent, click here). One can’t help but wonder if the result would have been different if Sven was earlier in the order, and not had the benefit of knowing what time he had to beat – his margin of victory was less than two seconds, over a distance of 5000m, huge in comparison to two thousandths, but still incredibly narrow. The pacing of a 5k must be very precise – a second slower per lap would give you a time of 6:22.26, which was incidentally the time of his fellow countryman Bob de Vries who was 15th (in a field of 22). Just as an indication of how much more competitive the field is – Jan Blokhuijsen, who won the silver medal in Sochi skated a second faster today than he did four years ago, but came 7th. But what’s done is done, and Sven retains the Olympic title in the 5000m and makes it a remarkable 3 in a row. Fortunately perhaps for the sport, even though the Dutch pick up another gold medal, the other two placings were picked up by Canada and Norway for a more diverse podium than we had yesterday. For any readers out there who for whatever reason wish to rewatch (or watch for the first time) the event, I provide a link to my audio commentary here, which you can download and watch alongside a video replay. I cannot vouch for the quality of my commentary – I have no real idea what I’m doing, and have never done this before, but this is a direct response to my own complaints about coverage from Sochi. Even though we’re only 2 days into competition I’ve already heard many similar complaints – commentators butchering people’s names and generally not knowing anything about the sport. At the end of this article is a link for the live broadcast for the ladies 1500m. 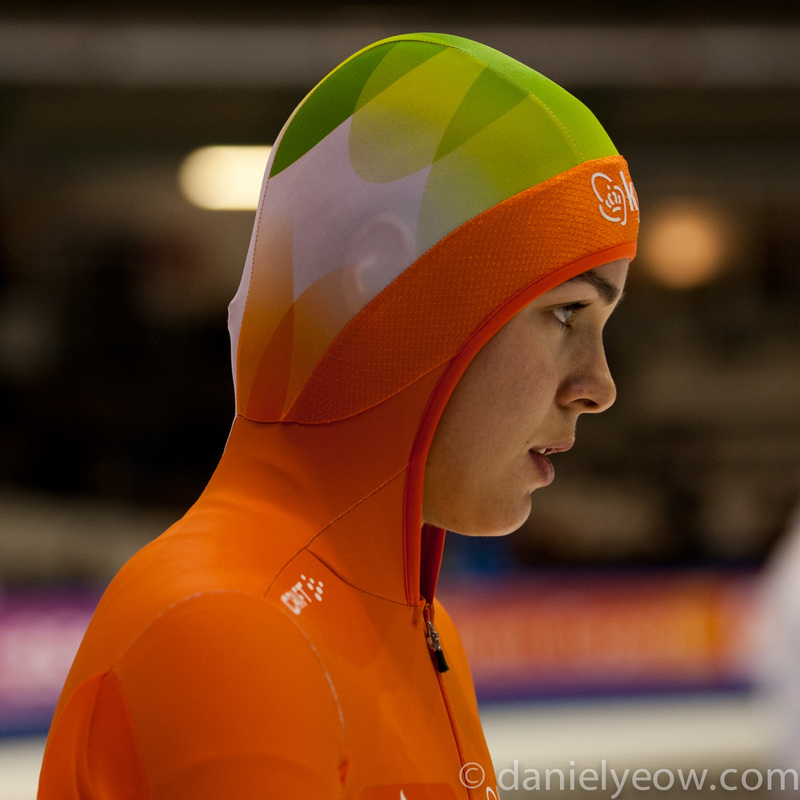 The ladies 1500m was dominated at the last games by the Dutch, who went 1, 2, 3, and 4. At this olympics, we are in the curious position where the defending olympic champion, shockingly, did not qualify for the event. The understand how this might happen, one must understand the way that olympic selection works – basically in the first 4 world cups of the season individuals compete for qualification “spots” for their country, which are then allocated by their country’s national governing body. Bigger skating countries like the Netherlands generally earn a large number of spots and then hold a separate qualifying competition to decide who gets those spots (smaller countries don’t have enough skaters or spots to do this, and generally award qualifying spots to the skaters who earned them). Defending olympic champion Jorien Ter Mors, who won very convincingly in 2014 had a really bad day at the dutch qualifying tournament. Amazingly, even without the defending olympic champion, the Dutch still have an extremely strong team – Ireen Wüst, Lotte van Beek, and Marrit Leenstra are still on the start list (they came 2nd, 3rd, and 4th last time). Of course, as one might expect, it’s not going to be a dutch sweep again. Definite favourite going in is Miho Takagi from Japan who won all 4 qualifying events at this distance – watch for a blindingly fast final lap. Also threatening are the skaters from the US – Brittany Bowe and Heather Bergsma who in the 2015/2016 season took turns swapping the world record in this distance and in the 1000m. Heather the currently more in-form of the two of them, having stood on the podium several times this season, while Brittany is still coming back from a concussion-injury she sustained in the previous season. I predict Takagi in 1st with Marrit Leenstra (pictured) who recently broke the Dutch record in this distance, in 2nd, with world record holder Heather Bergsma in 3rd. Physiologically, the 1500m is probably the toughest distance, and the most difficult one to get right. For those skaters who are more predisposed to the sprint events, the ‘trick’ is to get up to the highest possible speed for the least amount of effort, holding back a little bit in the early part of the race so that there is some fuel left in the tank to hold on to that speed until the end of the race. For the longer distance skaters, the idea is to go out at 100% or close to it right from the very beginning. Not having the top speed or acceleration of the sprinters, these skaters must put all their effort into reaching the highest speed they possibly can, and then use their advantage in conditioning and fatigue tolerance (as opposed to raw power output) to not lose speed as quickly as the sprinters as they tire out. Look out for very pained facial expressions in the final corner, and vomiting skaters at the end of the races.